Landscaping Ideas for Shade - Executive Landscaping, Inc. When it comes to outdoor space, shade can often present one of two situations. Either you need more of it in certain areas or you have too much of it and need to take measures to counteract some of its effects on your landscape. 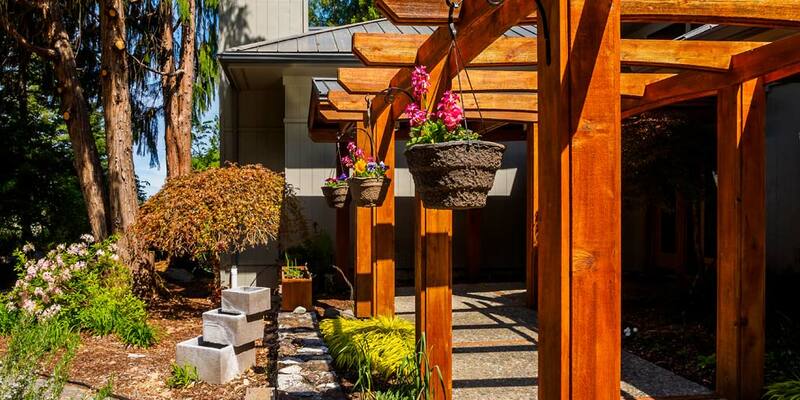 Regardless of which case pertains to your yard, shade should never become an issue that keeps you from having a great landscape or enjoying your yard to its fullest. Having too much sun beating down on your yard can create the problem of giving your plants no relief from the heat. It can also make spending time outside in your own backyard less appealing. Fortunately, you can create shade using plants, trees or even a few hardscape solutions that will help beat the heat and give you a yard that’s made in the shade. Planting trees whose mature height and span will create a natural source of shade is always a great solution. Waiting for those trees to reach full maturity, however, isn’t always ideal, so think about trees and plants that are still tall enough to create a source of shade right away. Tall grasses like pampas are perfectly appealing, as is bamboo, and both have the added benefit of offering privacy as well as shade. Landscaping with palms that are sizeable is another option, and your yard will have a great tropical feel. If you choose to build something, try trellises or pergolas draped in creeping plants. Extend the line of your outdoor patio with an awning where you can create an outdoor kitchen or install an outdoor fireplace. Landscaping for shade doesn’t necessarily mean using plants, so discuss your options with professionals like the team at Executive Landscaping, Inc. to design a plan that works for how you want your yard to function. The flip side of not enough shade is, of course, too much shade. Overly shady yards sometimes present a challenge in that many plants won’t grow well without getting their daily dose of sun. In this case, you’ll need to select plants and types of foliage that love the shade and can tolerate the lack of sun. Grass, unfortunately, isn’t one of the best things for shady spots. Instead of fighting a losing battle, try replacing grass in those areas with ground cover plants that thrive in the shade or reducing the amount of grass and using hardscape elements as accents. Areas with natural shade can work to your advantage in some ways. By planting those shade-loving plants and flowers and adding a few elements like seating and a water feature, you’ve created a little oasis in your yard. Not only is it an escape from the heat and sun, it’s also an escape for the senses. Now, who doesn’t love a win-win like that? Give the outdoor experts at Executive Landscaping, Inc. a call today to learn more about how we can create an Executive Masterpiece for you!